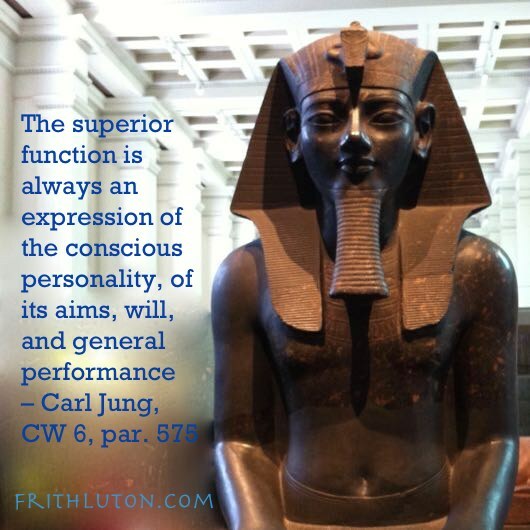 Over the years, Jung’s model of typology has been very significant to me as a psychological compass. But I have to say that I learned almost as much about typology from living with Arnold as I did from reading Jung. I met Arnold only a few weeks before leaving for Zurich, where we had both been accepted to train at the Jung Institute. We took to each other and agreed to share a place, which I offered to find since I would be there first. I house-hunted for a week and found a gem. Arnold, it turned out, was a raving intuitive. I met him at the station when he arrived. It was the third train I’d met. True to his type, his letter had been sketchy on details. True to my predominantly sensation orientation, I wasn’t. “Great!” said Arnold, holding a newspaper over his head. It was pouring out. He had no hat and he’d forgotten to bring his raincoat. He was wearing slippers, for God’s sake. We couldn’t find his trunk because he’d booked it through to Lucerne. “Lucerne, Zurich, it’s all Switzerland to me,” he shrugged. It was quite amusing at first. I’d never been close to anyone quite so . . . well, so different. Time meant nothing to Arnold. He missed trains, he missed appointments. He was always late for class, and when he finally found the right room he didn’t have anything to write with. Arnold didn’t know a budget from a budgie; he either had bags of money or none at all. He didn’t know east from west, he got lost whenever he left the house. And sometimes in it. “You need a seeing-eye dog,” I joked. “Not as long as you’re around,” he grinned. He left the stove on overnight. He never turned out lights. Pots boiled over, meat turned black, while he sat on the porch watching the sky and musing. The kitchen was forever filled with the smell of burnt toast. Arnold lost his keys, his wallet, his lecture notes, his passport. He never had a clean shirt. In his old leather jacket, baggy jeans and two different socks he looked like a bum. His room was always a mess, like a hurricane had hit. “It drives me crazy just to look at you,” I hummed, adjusting my tie in the mirror. I liked to be neatly turned out, it made me feel good. I knew precisely where everything was. My desk was ordered, my room was always tidy. I turned out the lights when I left the house and I had an excellent sense of direction. I didn’t lose anything and I was always on time. I could cook and I could sew. I knew exactly how much money was in my pocket. Nothing escaped me, I remembered all the details. “You don’t live in the real world,” I observed, as Arnold set out to fry an egg. A real hero’s journey. He couldn’t find the frying pan and when he did he put it on the cold burner. “Reality as you know it,” he said, quite hurt. “Damn!” he cursed. He’d burnt himself again. I need not say much here about the added aggravations due to Arnold being an extravert and me an introvert. Enough to say there were plenty. He brought people home at all hours of the day and night. I liked privacy, my own quiet space. I was concerned to keep to my timetable. During the day I escaped to my room and studied, or pretended to. At night I lay in bed with a pillow over my head, listening to them carouse. On the other hand, Arnold’s way of functioning was sometimes quite helpful. Like when we furnished the house. Naturally, I had not come to Switzerland without learning some German. Before leaving Canada I took a Berlitz course for six months. I wasn’t fluent but I could make myself understood. I could also get by in French. Arnold knew no French and could not even count in German. I think he did not realise he was coming to a foreign country. I scolded him about this more than once. As it turned out, they didn’t. Worse, and to my chagrin, the language of the streets was Swiss German, a dialect, almost as different from German as Welsh or Scottish is from English. I was just about as helpless as Arnold. Back to the department store. In one language or another, we managed to spend a lot of our landlady’s money. While I fumbled to say exactly what I meant, Arnold waved his hands and gesticulated. By the time we left, ushered out by a grateful crowd of salespeople, we had a few things I hadn’t thought of: a Chinese screen, two Indian carpets, a complete set of dishes and cutlery (for eight), ten pounds of bratwurst, a commode reputedly used by Louis XIV, and several numbered prints by Miro and Chagall. Gretchen was thrilled. She gave us a special dinner. Arnold stayed behind when I left. “I’ll just wrap up the lease,” he winked. I struggled to appreciate Arnold. I wanted to. His outgoing nature and natural ebullience were charming. I admired his air of careless confidence. He was the life of every party. He easily adapted to new situations; was a lot more adventurous than I was. Where I hung back, tentative and wary, he plowed ahead. He easily made friends. And then brought them home. He had an uncanny sense of perception. Whenever I got in a rut, bogged down in routine, he had something to suggest. His mind was fertile; it seethed with plans and new ideas. His hunches were usually right. It was like he had a sixth sense, while I was restricted to the usual five. My vision was mundane—where I saw a “thing” or a “person,” Arnold saw, well, its soul. But problems constantly arose between us. When he expressed an intention to do something I took him at his word. I believed he would do what he said he would. This was particularly annoying when we had arranged to meet at a certain time and place and he didn’t show up. That isn’t how Arnold saw it. That was typical. I was prosaic, he was lyrical. One morning I got up to find yet another pot boiled empty on a hot burner. Arnold struggled out of bed, looking for his glasses. “Have you seen my razor?” he called. Arnold shuffled into the kitchen as I threw the pot out the door. It was true. My face got red. My balloon had been pricked. Reality as I knew it just got bigger. “I forgot,” I said meekly. Arnold clapped his hands and danced around the room. “Join the human race!” he sang. As usual, he couldn’t hold a note. Only then did I realise that Arnold was my shadow. This was a revelation. It shouldn’t have been, since we had already established that our complexes were radically different, but it struck me like a thunderbolt. I said as much to Arnold. All that was a long time ago. In the intervening years I’ve become more like Arnold. And he, more like me. Not only can he tell left from right now, he irons his tee-shirts and has learned to crochet. Arnold dresses impeccably and his attention to detail is often sharper than mine. He lives alone and has a fabulous garden. He knows the names of all the flowers, in Latin. Meanwhile, I have dinner parties and have been known to haunt the bars till dawn. I misplace precious papers. I forget names and telephone numbers. I can no longer find my way around a strange city. I pursue possibilities while things-to-do pile up around me. I could not cope without a cleaning lady. Such developments are the unexpected consequences of getting to know your shadow and incorporating it in your life. You lose something of what you were, but you add a dimension that wasn’t there before. Where you were one-sided, you find a balance. You learn to appreciate those who function differently and you develop a new attitude toward yourself. Arnold and I are still shadow brothers, but now the tables are turned. I tell him about my latest escapade. He shakes his head. “You damn gadabout,” he says, punching my shoulder. Arnold describes quiet evenings by the fire with a few intimate friends and says he never wants to travel again. This man, this great oaf, who used to be off and running at the drop of a hat. “You’re dull and predictable,” I remark, cuffing him.